In addition to the weekday deliveries, this branch also offers a local delivery service on Saturday. Woods Way, Mulberry Lane Trad. Est. Our Goring-by-Sea Decorator Centre, West Worthing, has been a fixture on the Mulberry Lane Trading Estate for around 30 years. We still have customers coming to us who started sourcing their trade paint here when we first opened. We’re right next door to World of Books on Woods Way. There’s lots of parking directly outside, with simple wheelchair access to store. 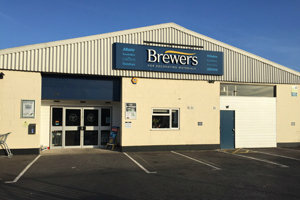 Just like all Brewers branches, we stock a large range of paints, wallpapers and decorating equipment, and you can always order online to store. We also do local deliveries to site. It’s worth making the trip to visit us though; our staff have been here almost as long as the branch has been open – two with more than 25 years’ product knowledge and another with 17 years. There’s even a nostalgia area displaying paints nearly as old as our branch. Drive to the end of Mulberry Lane and turn right on to Woods Way. From the A259, turn left on to Mulberry Lane. From Jupp's Lane, at the end of the road turn left on to Mulberry Lane.